I am very excited to be partnering with Crystal from Money Saving Mom to bring you a great deal on Grocery University starting tomorrow morning! 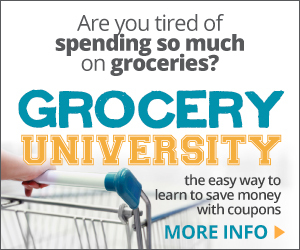 Grocery University is course designed to help you learn how to save money and coupon successfully. It includes step-by-step help to help you lower your grocery bill through an audio course. There is no reading required; however, this course does come with a downloadable PDF file with tips, visual aids, and example scenarios. This course is normally $19.97. Since Crystal is relaunching it starting tomorrow, it will be at a SUPER low price starting bright and early tomorrow morning. After tomorrow, the price will go back up to $19.97. I would highly recommend purchasing it FIRST thing tomorrow morning to get the best of this deal. By purchasing it first thing tomorrow morning, you are saving 85% off the purchase price!